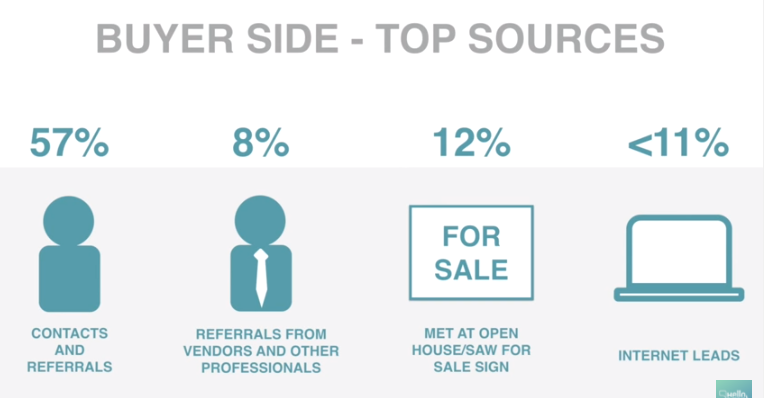 Jay Sherer in his video (below) suggests most realtors, based on industry stats get most of their leads via their contacts and referals. That’s misleading because most realtors don’t have much of an Internet presence so how could they acquire Internet leads? 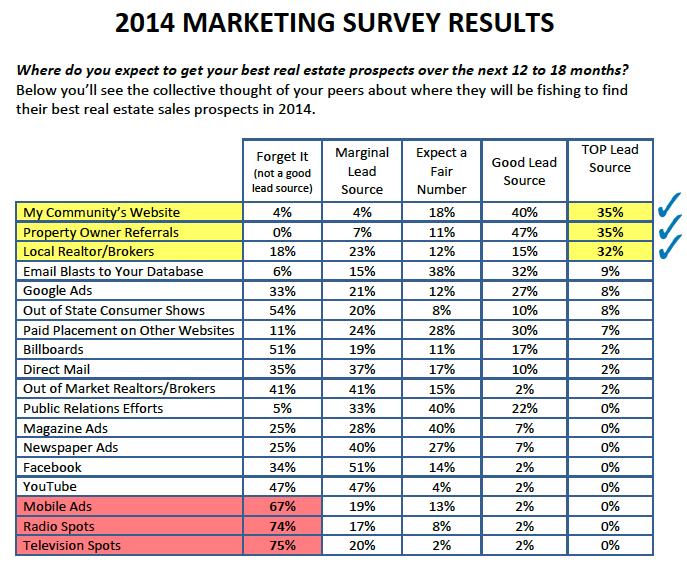 We could ask doctors and dentists where they get their real estate leads and we get the same stats. In other words, these widely “dished out” stats are actually a skewed look at each of the potential sources of real estate leads. 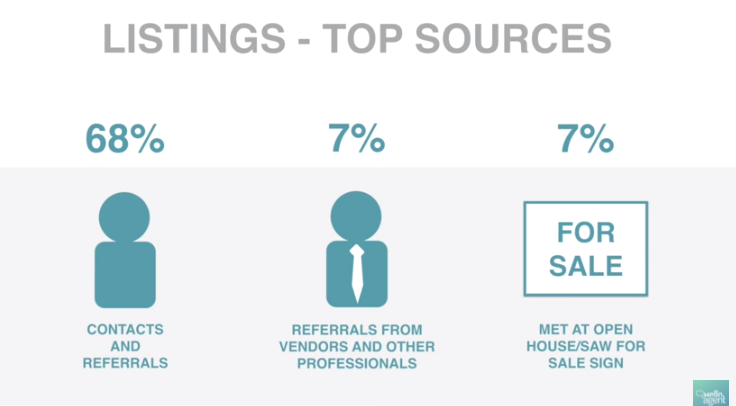 To get accurate stats, we need to interview the top selling individual agents online. Jay points out that agents get buyer leads mostly from their own contacts, but is this because that’s all most agents to get their leads? If they’re doing online lead generation at all, or well, they won’t be getting much action there. It’s the same for seller side leads. Most buyers are sellers so they’re going to go online before they sell for one reason or another. As a realtor, you just have to be online in the right locations and voila, they see you. That one seller you get contacted by, may know others who are selling too. They usually share that infomation too. Jay mentions that one agent lost a sale from one of his top contacts because he wasn’t in touch with them, and they went with another agent. If you’ve got 500 contacts, ya, it would be tough to keep tabs on them all, and one could slip through your fingers. The internet can be used to build personal contacts and it’s a fantastic source of buyers and sellers looking for a home or agent. Real estate agent, you may not know, is a popular search term on Google search and is one of the most expensive keyword phrases you can bid on in Google Adwords. Many people aren’t acquainted with a real estate agent, or they’ve simply forgotten names. If the agent had been doing social listening (predictive analytics) he might have known quickly that his client was making noises about buying and selling. So even though he had the client in his stable, it actually meant nothing. The internet is a more active medium and keeps you on your toes. Here’s a number of graphics showing potential lead sources. What do you think? This graphic from Agent Jet shows that Facebook advertising may be becoming one of the better lead sources due to its excellent demographic targeting. Survey by Private Communities about best real estate sales prospects. 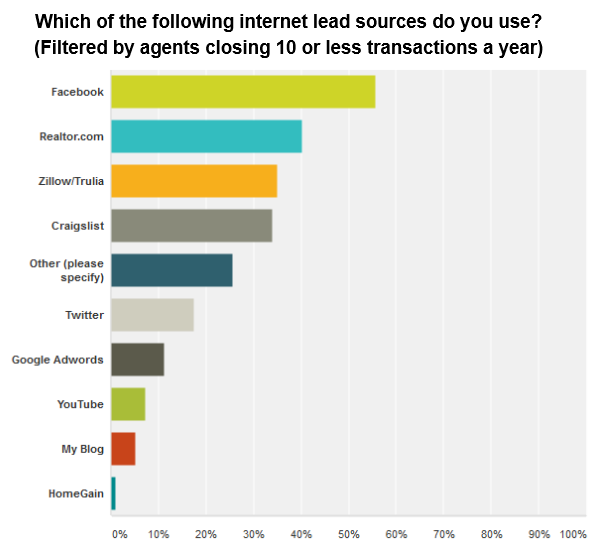 Here’s the top 10 best sources of real estate leads. If you don’t like the order, then please leave a comment and give your reason for which lead sources are the best. New meetings with people: phoning, socializing, and door knocking — talking to as many people as possible builds your local network. 50 introductions should create a lead. Online Leads — Google and Youtube indexes your videos, website pages, blog posts and social media posts and presents them to prospects who area searching for homes. Being in those searches is critical. If you have a high traffic generating site, it could brings tens of thousands of visitors and out of that volume, a lot of excellent prospects and new clients. Passive Expireds – they didn’t sell their home. Why? Open Houses are an invitation via email, social media message, or yard sign. It gives you a face-to-face opportunity to meet people interested in buying or selling a home. You can hand out business cards to those who are curious and get them to look at your website and start searching on it. Major Brokerages – Remax, Centur21, Coldwell Banker and Keller Williams something dish out leads who came to their offices (walk-ins) or online searches at their brokerage website. Online Lead Generation Companies – They do mass advertising campaigns on Google, Yahoo, Facebook, Twitter, and other websites as their lead farm. Check out which are the best lead generation companies and evaluate which are worth a try. Jay Sherer mentions that one agent reportedly paid $8400 to Zillow for leads. That’s great yet you can do better if you get yourself front and center online. Don’t think that Realtor.com, Zillow, Trulia, Remax and all the rest of the big portals are too competitive. They aren’t. I beat them and so can you. Great content and really good real estate SEO can make you a high traffic, online lead generator comparable to the best lead generation companies. 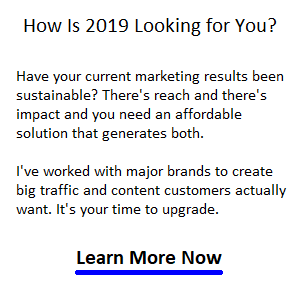 Gord Collins — Real Estate SEO Consultant — I generate leads for realtors in Los Angeles, Phoenix, Denver, Seattle, Chicago, Boston, New York, Dallas, Houston, San Antonio, Austin, St Louis, Minneapolis, Green Bay, Charlotte, Tampa, Miami, Orlando, Toronto, Vancouver, Montreal, Ottawa, Oshawa, Hamilton, Newmarket, Richmond Hill, Oakville, Calgary, Kelowna, Mississauga, Anaheim, Beverly Hills, Malibu, San Diego, San Francisco, San Jose, Fresno, Santa Clara, Sacramento, Mountainview, Palo Alto, Portland, Washington, Atlanta, Irvine, Nashville, Sunnyvale, Salt Lake City, Riverside, Rancho Cucamonga, Costa Mesa, Thousand Oaks, Simi Valley, Raleigh, Albuquerque, Glendale, Oceanside, Long Beach, Huntington Beach, Carlsbad, Santa Clarita, Henderson, Mesa, Temecula, Kirkland, Redmond, Kansas City, St Louis, Stockton, Scottsdale, Palm Springs, Indianapolis, Columbus, Colorado Springs, Fort Worth, Chula Vista, Escondido, Santa Monica, Miami Beach, and Honolulu. Find a Los Angeles Real Estate Agent who will actually work for you.